The day began with breakfast for the fussy-eater big boss of course. There's this strawberry cream bun coated with chocolate called Squiggles by Gardenia, RM1. Bought it to try for Kz's breakfast. Taste nice. But if you have (mild) OCD like me, don't give this bun to kids and then, let them walk around in your house. You'll cry. 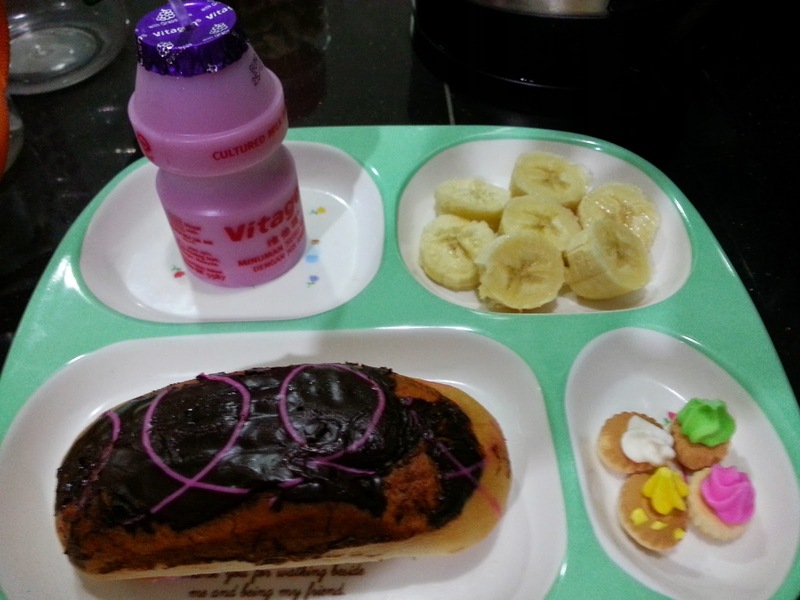 I used one banana for Kz's breakfast platter. I have about 3 bananas left from the bunch. I was thinking of banana cake already - without the oven. Steamed? Ok, jom, let's start! Ingredients: 1 mashed banana (could use 2 actually), 3 heaping tablespoon flour, 1 heaping tablespoon cocoa powder, 2 heaping tablespoon sugar, 2 tablespoon condensed milk, 3 tablespoon cooking oil, 1 egg and 1 teaspoon baking powder. I added cocoa powder because I love the name - chocolate banana cake. It tasted so so so very good. I strongly urge everyone to try this. You don't even need an oven nowadays to make cakes. Forget the electric mixer. Stir everything together in a bowl using fork (that was what I did) and steam for 20 minutes under high heat. Results? Very very very soft and moist fudgy chocolate banana cake lah, what else! Nothing to do with the title but this is them, after lunch - noodles with my ABC soup (hah, again? Yeah, they never haven't got bored of it yet) and some chocolate banana cake. Burrrppp! Morning Louiz! 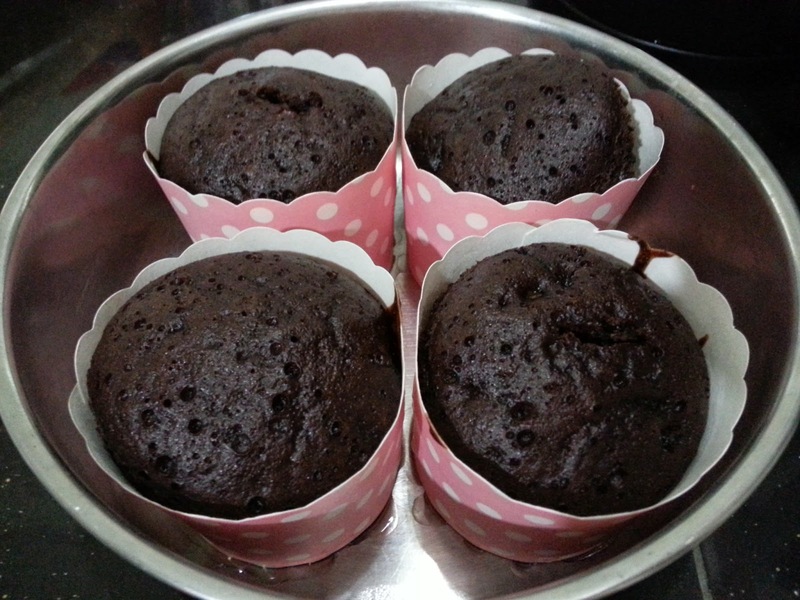 Very nice steamed chocolate banana cupcakes! Good lah you do a small recipe and I can also follow if my mouth itchy :) It is useful to have small recipes like this if want to just make a small portion. The 4 cupckaes will be just nice for me in one sitting. I see that both Kz and G have grown a lot. Oh yes, G very tall now.. Kz still the same, skinny, fussy eater, heh.. Oh yes, I always divide your recipe until it reaches 1 egg coz most of the time, only me and the kids eating..
Good morning Louiz! Haha. I could not help laughing when you mentioned the OCD in your 1st paragraph. I dont think I have one but I do hate those crumbs and food mess on floor and table. I would scold, nag my kids while cleaning after them each meals. Lol. Oh yes, really, if you are a clean person, and *ahem* you like to always look clean, then please don't give your kids Squiggles and let them walk around.. Haha.. The cupcakes are not fattening, there's no butter in it.. But got cooking oil la.. And there's sugar and condensed milk too, hehe.. So erm, yeah, maybe it's fattening also, hehe.. Oh this time I shared with the boys, and I kept one for hubby.. He ate it in the evening and they are still VERY soft and moist! Wowwww!!!! Looks so good, very moist. Yes yes yes! 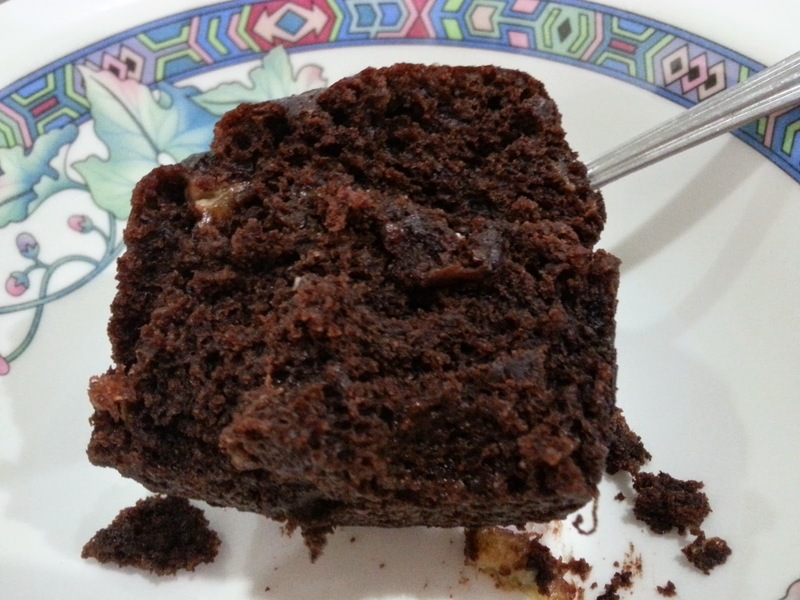 They are STILL very soft and moist when hubby ate it in the evening.. I steamed those cupcakes at about 10am in the morning, hubby ate it around 5pm, still very soft..
so this is a report about how you spent your weekend?? 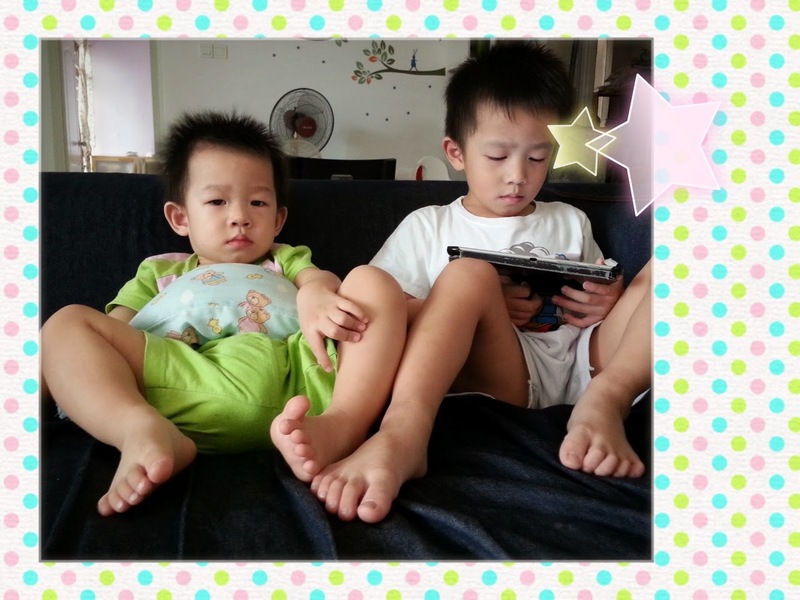 haha.. doing housework, cooking and baking and taking care of your three boys at home.. okay lah, easy peasy mah.. me also didn't do much la, the only more special thing I did was watching a movie on Saturday night lor.. Hunger Games Mockingjay (Part 1).. aiyoh actually dunno why purposely stretch and break it into two parts lor, one shot cannot meh?? maybe the last installment and still wanna earn the money from the movie fans gua.. nothing new lor hor?? just like last time the last one for Harry Porter..
wah, so chocolatey!! rich and moist!! 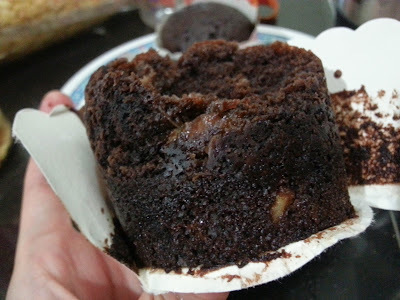 errr, I think I will just go and buy two chocolate muffins from the shelf la, you know next to your Squiggles there's always this Gardenia muffins that comes two in a pack?? haha, that one I actually quite like leh, of course not very good but for kids still okay gua?? but then I think you are not that lazy lah, you can bake of course bake yourself lor, takkan go and get something sub-standard to your own baking mah, correct?? Haiyoh, SK, you so smart la.. Why you so smart one.. Yeah, I've run out of food to cook, and now it's getting more & more "convenient", just buy from the shelf, and assemble onto the plates only.. OEM - Original Equipment Manufacturing? Geng wor you, like that also can think of, teehee.. I'm laughing when you say paint the house in dark colours.. Errr, really la, imagine kids holding Squiggles and then touch here touch there, walk here walk there, in your sofa, walls, curtains, errr, you'll cry leh..
Not self praising, but they taste good leh.. Maybe becoz I put a lot of sugar (and condensed milk), so they are very "creamy" and moist.. I don't know about others, but I like my cakes/desserts SWEET! I laughed when I read that you have mild OCD and ended crying when the kids leave traces of mess after eating the chocolate buns... You sounded exactly like me!!! LOL! Your steamed chocolate cake look great!!! They look very moist! Oh yes sweetie, they're very soft and moist, I steamed them around 10am, and hubby ate one around 5pm, still moist! I feel your kids are very hang fook, mommy always prepare nice treats for them..
Yep, they're moist and soft leh, not dry, I promise! G loves it but Kz just took half.. Fussy eater..
What a lovely mummy you are! You would always put effort to pamper the boys more than yourself. I love your chocolate banana cupcakes. I tried to steam once from Small Kucing's recipe and it was easy! Now I should try yours too. You are right when you say I pamper them more than myself.. I have to say I NEVER pampaer myself anymore ever since having kids and it's all about THEM 24 hours a day, 7 days a week, really! Princess is baking again ;-) u reminds me of my childhood where my mum bakes butter cakes, chocolate cakes, rock bun, mcm mcm....but she has since retire from baking since i reached teenage age...coz the oven broke down (& never been fixed). My type of baking is (worse than) amateur baking only.. Have you seen MarterChef Junior? OMG, they can bake/cook as young as 8! sounds simple. I will try it one day.. Yes, it's really simple.. Don't need an even and the texture feels like cake.. Surprisingly, the paper didn't get soggy, really! Wah ...princess can bake ! Bake a bit can la.. If pro punyer bake, cannot lor.. Both your bosses really sit like bosses! LOL! Yummy choc cupcake. They love your soup and noodles, so that's enough for them. Almost every week they have the same thing.. Noodles with ABC soup for Kz, and porridge cooked with the same ABC soup, teehee.. Happy Holiday to you tomorrow! Enjoy! Eh you didn't update for so long? I thought I read and commented on this one already but it seems like I must have not clicked Publish. I usually post like once a week.. My life is very boring, so there's not much to blog about, hehe.. I dont always go out or eat out.. Working on weekdays and stay home on weekends, go mil's place or hypermarket for grocery shopping only..